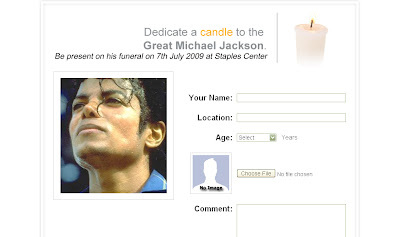 Lit A Candle Before Michael Jackson Funeral Time... http://www.hothollywoodcelebrities.com is the site where many people has gathered from the very morning at this day 7th of July to dedicate a candle for Great Micheal Jackson.. 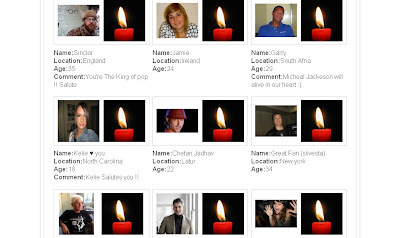 In photo : The MJ Fan Club where you can dedicate a candle in memory of Great Michael Jackson,in case you can't make it to his funeral on 7th july 2009, at the staples. Please send this atleast to 10 of your friends and relatives for good luck and blessing from Michael Jackson!! In photo : From the very morning on this great day people from all over the World has gathered here in this site to lit a candle for the peace of his soul.. Around 200 of Fans gathered here in this site to bless.